This image of the Acoma, New Mexico, highlights the stacked domestic of architecture of the pueblo. It also suggests how residents used rooftop spaces to watch events in plazas down below, a practice also known in enormous urban centers like Mexico City. 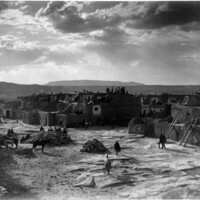 The houses and streets of Acoma were built and maintained by Pueblo residents of the town. Families and clans of Pueblo residents shared this responsibility. 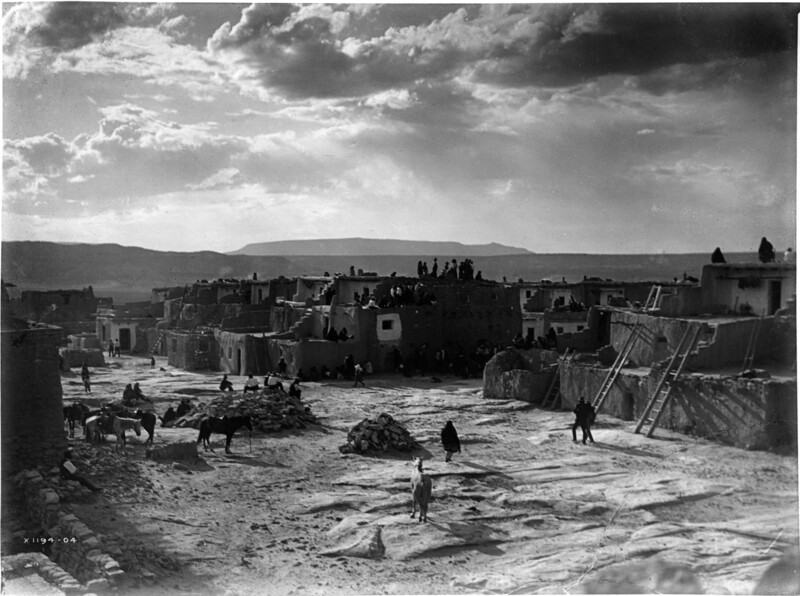 Edward Curtis, now known for his images of indigenous American communities and portraits, is among the most famous of several Anglo-American photographers to visit Acoma in the late 19th and early 20th centuries. His photographs were often considered “documentary,” although nearly all his images involved some posing and retouching; many were published in luxury volumes that were the only contact most Anglo-Americans ever had with indigenous Americans. The houses of Acoma were built primarily of adobe bricks and wood beams. Stone is also present and, by the time this image was taken in 1904, glass windows were also used. The photograph, taken by Edward Curtis, was printed from a 6.5” by 8.25” (16.5 cm by 21 cm) nitrate negative. From the metropolitan perspective of Mexico City, Acoma—which is a pueblo in the modern state of New Mexico—was an isolated place far away, in the northern-most reaches of New Spain. From a local perspective, the people of Acoma never sought to be part of “Spanish America.” In fact, Acoma residents fought bitterly against Spanish soldiers in the late 16th century and again during the Pueblo Revolt of 1680, when they also housed indigenous people fleeing other pueblos. By the time this photograph was taken, Acoma was part of the United States. This image, however, stresses the isolation of the community rather than its interactions with outsiders. This photograph is today housed in the Palace of Governors archives in Santa Fe, New Mexico, an exceptional collection of Southwestern photography. Acoma has long valued its reputation as resistant to outside influences. It is a town both within and at the edges of Spanish America. In material terms we see this in the architecture, much of which owes its design to long-standing indigenous traditions, yet the design of the mission church, which can also be seen in Vistas, parallels that of other churches built under Spanish supervision in the region. And objects associated with daily life, especially ceramics, also reveal links to materials used farther south in Mexico. Even in 1904, when this photograph was taken, the town was not wholly isolated from outsiders. Many residents lived in communities on the valley floor and a major railroad passed nearby. Today, Acoma is registered as a National Historical Landmark, and the tribe supports a large cultural center and museum. McHenry, Paul. 1990. “Rebuilding Acoma Sky City.” APT Bulletin 22 (3): 55-64. Treib, Marc. 1993. Sanctuaries of Spanish New Mexico. Berkeley and Los Angeles: University of California Press.